So we all know the hugely popular version of this drink, which I have to admit that I've never actually tried, however I LOVE the sound of it. I'm really not a fan of that coffee chain and I wanted to make my own version healthier and with all natural ingredients. If you can find a good quality canned organic pumpkin puree I'd use that however if you can't, making your own is very easy. Just put a 1/4 of a small pumpkin cut-side down on a baking sheet and bake for about 45 mins until totally soft. Then scoop out the flesh and blend it until totally smooth. I've used both oat milk and cow's milk for this recipe, and they both turned out great, so use whatever kind of milk you'd prefer. This is how I like mine, but if you want it sweeter, spicier or more pumpkiny just up the quantities to your taste. If you have a milk steamer to heat everything together that would be amazing, however I don't, so I heated the milk and pumpkin puree in a saucepan before tipping everything into a blender and whizzing it up for about 30 seconds until the milk became frothy. 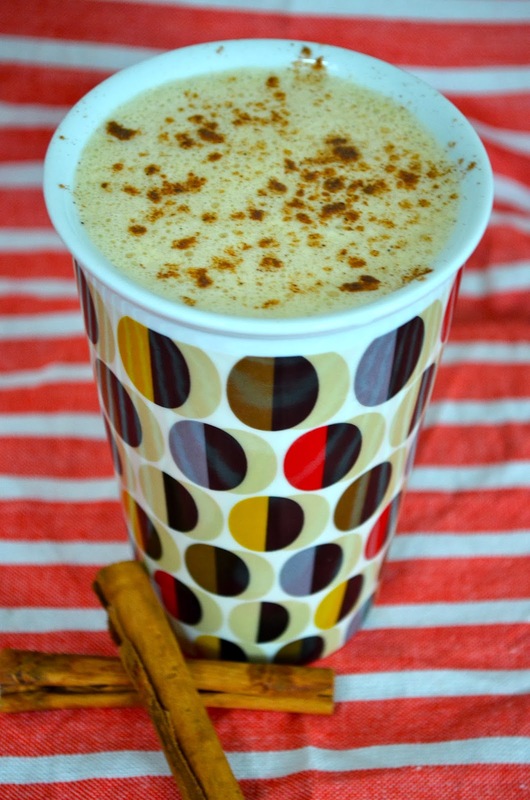 Top with a sprinkle of pumpkin pie spice and enjoy! It's as easy as that. This is one of those perfect autumnal dishes that warms your bones and leaves you in a contented slump on the couch. This is not a light, pretty or delicate kind of dish, it's deep, earthy and totally comforting. I've adapted this recipe from Simon Hopkinson's version and I think it turned out fantastically. At the first mouthful Isaac and I exclaimed a loud "Mmmmmm" in unison and barely said a word until we squabbled over seconds! You start off with 500ml of milk in a saucepan (I used low fat cows milk but if you wanted to make it with a milk alternative I'd use a light and unsweetened version as otherwise it would be far too heavy) and 15g of dried wild mushrooms. I used a combination of Italian porcini and dried French wild mushrooms but whatever you can get your hands on is perfect. Poach the mushrooms for about 10 mins on a low heat making sure the milk doesn't boil but that the mushrooms become soft. Turn off the heat and leave it to sit for another 10 mins with the lid on. During this time I sauteed 2 large field mushrooms in a pan with some thyme and a bit of garlic and set aside. Strain the mushrooms from the milk but make sure to catch all the liquid in a bowl. With a bit of flour and butter (I used a vegan substitute) make a roux and whisk in the still warm milk and seasoning until thick and glossy. I cooked enough tagliatelle for 2 for about 8 mins before adding it to the white sauce and mushrooms. To finish it off I sprinkled garlic and herb breadcrumbs (you could use cheese if you wanted) over the top and baked it in hot oven for 20 mins until golden brown. This is such a delicious meal and I'm positive I'll be making it again on those cold, autumnal nights when nothing else could hit the spot. Hey all, I'm really sorry for my almost month-long absence from blogging, but don't worry, I'm back and kicking things off again with some delicious lemon, yogurt and poppy seed buns! I opened my kitchen cupboard recently and saw a big tub of lovely organic blue Turkish poppy seeds that have sadly not been used in a while, and felt that lemony-yogurty buns just had to be made. With a big cup of tea and a pair of fluffy socks they're a perfect treat for a chilly, early-autumn afternoon. I love simple bun recipes, where you premix all of the wet and dry ingredients separately before combing them. No faffing about creaming or beating things together, just bung it all in! Starting off with the dry, I used Dove's Farm organic white spelt flour, dark brown sugar, baking powder, pinch of salt and 2 teaspoons of poppy seeds. And for the wet I used, 2 organic eggs, a good dollop of vanilla bean paste, low fat organic natural yogurt, lemon juice, lemon zest (unwaxed) and sunflower oil. The recipe makes 12 buns and they bake in 18-20 mins. The smell of the lemon and vanilla filled the house with such a gorgeous aroma that I was barely able to wait for them to cool down before brewing up a nice strong cup of tea and tucking in. Because I used sunflower oil instead of butter they had a lovely light texture with a great crumb structure. I don't like overly sweet bakes so I reduced the amount of sugar by a good bit, and thought they were perfect. I'm not one for icing either so I just have them as they are, but a pretty lemony swirl of icing would look very pretty. They should last about 3 days in an airtight container but realistically that won't happen! They're too good to resist!